Sorry, but we are currently not taking on any new volunteers because sometimes we get such a big turnout that we have trouble managing the task and keeping track of everybody. 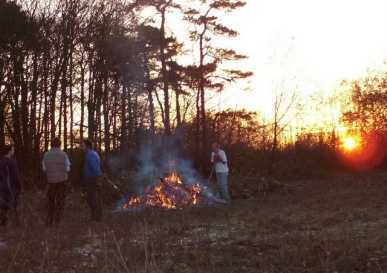 We do voluntary conservation work on Greenham and Crookham Commons near Newbury, West Berkshire. 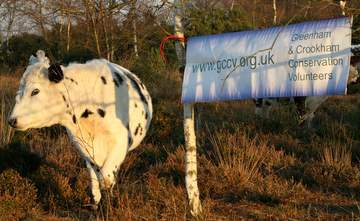 Much of the site is the former Greenham Common Airbase, famous for cruise missiles and peace protesters, but a parish boundary runs right across the area so it is actually two adjacent commons, hence our name. As with most lowland heath, the commons have a tendency to revert to scrub and woodland. If this were allowed to happen, the special heathland flora and fauna would be lost. So, a large part of our work (from autumn through to early spring each year) is tree and scrub clearance. But we can't do scrub-bashing during the bird nesting season, so late spring and summer tasks include things like fence and footpath maintenance, or controlling invasive species such as Himalayan balsam. Some of our regular volunteers live around the commons, some are from the surrounding district (North Hampshire as well as West Berks). Others are from much further away – We've had volunteers from as far away as Hong Kong! 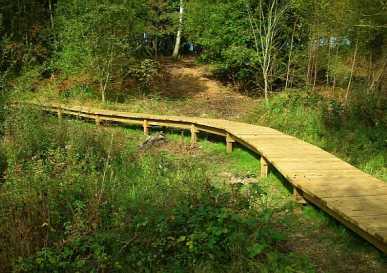 The commons are owned by West Berkshire Council (WBC) and managed by the Berks, Bucks & Oxon Wildlife Trust (BBOWT), who have a Countryside Ranger on the site. All our tasks are planned in consultation with the Ranger, to fit into the management plan. BBOWT provide tools and materials, and have also provided training – some of our regular volunteers have been trained in chainsaw and brushcutter use, tree-felling and herbicides application. We are affiliated to the BTCV (British Trust For Conservation Volunteers), and registered with Volunteer Centre West Berkshire. 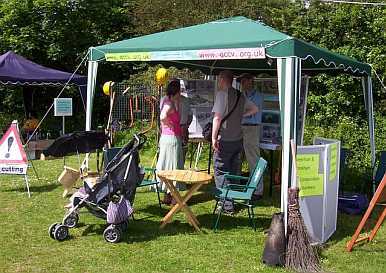 If you can't join us, both organisations have plenty more volunteering opportunities. There used to be a pub on the Common. Its name was The Volunteer. (NB this is the FOURTH Sunday in April, date moved due to Easter).